Do you know what a Nativity set is? Do any of you have one in your house? Nativity sets are little scenes that show the manger scene – the Baby Jesus born in a manger. So, let’s play a little game: let’s try to guess all the people and animals that might have been there in the barn with baby Jesus. Well, I suppose we should see how well we did, right? So I thought I’d bring my Nativity set from home as a way to check. So, what’s different about this one? Right…there’s a wall in the middle of the manger scene. Makes it kind of hard to see what’s on the other side, right? Where do you think that came from? Well, humans put it there. They built it. That makes me sad, because there’s a wall like this on the other side of the world, where people are prevented from seeing Jesus every day. I don’t know how to make it better, but I do know we can pray. Would you like to pray with me? Dear God, it is sad when we build walls so that people are kept from seeing your Son Jesus. We ask you take down those walls so that all might be able to see your Son. Amen. 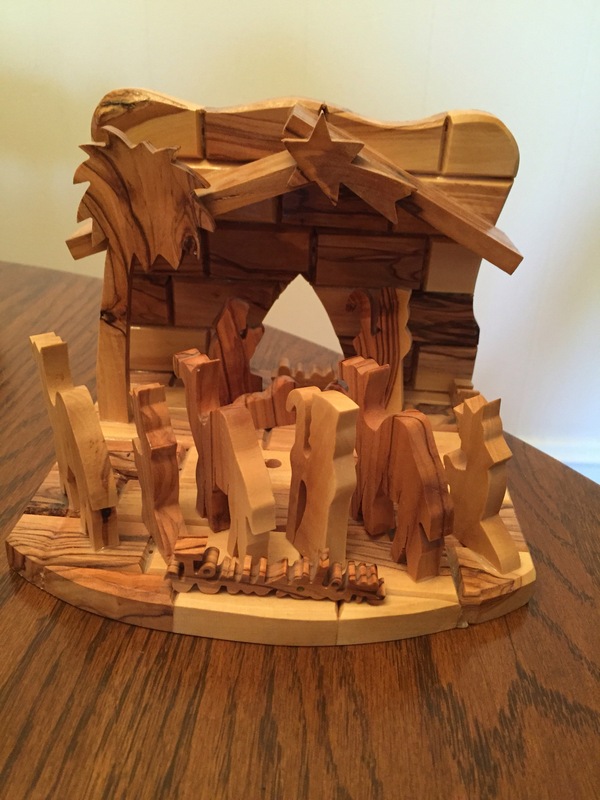 My wife Kelly traveled to Palestine and Israel this past summer, and bought this Nativity set. It’s quickly become a favorite of mine, and I’ve often looked at it the past month, reflecting on what it means that the Israeli government has built a wall to separate Palestinians – who are both Christian and Muslim – and Israeli Jews. I’ve done some research on my own, and as of 2012, the Israeli government has spent 3 billion dollars to construct the all in various forms across the countryside, and spends about 300 million annually for upkeep and to maintain security along the wall. All I can say is, that’s a lot of effort and resources simply to keep yourself separated from another group of people. There’s been a whole lot of building walls in our country this past year. Seems like walls are being built in one form or another: walls that divide people by race, ethnicity, social-standing, politics, religious beliefs. Walls get built that divide us by standards of physical beauty, popularity, and ability. Walls get built that keep out the unrighteous, the ungodly, the unfaithful, and the sinners. Walls get built that keep out those we perceive at the very least threaten us, and at the very worst, will try to hurt or kill us. We’ve built walls, and we’ve invested a lot of time and energy and resources into building them; and all to keep us safe, to keep us secure. Or so we think. Safety and security in this life is an illusion…..I don’t know about you, but as I stand here there are those around the world who live in real terror night after night, those who are stationed across the globe to provide safety so we don’t have to think about it, and without basic living necessities like food, water, and shelter. I have friends who are facing battles with cancer, friends who are struggling in their marriages, friends who struggle with self-worth. And there are those who cannot be with us tonight simply because age has robbed them of the ability to drive at night, or an accident has left them injured and in pain. And I’m sure for each of you tonight, you know of similar struggles….you have similar struggles….that have left you unable to be at peace, to find joy, to experience love, and hope at best, is a dream. On a night like this, I wonder if these walls we’ve built between each other are that important. On a night like this, I wonder if the divisions we draw really are worth the time and effort. “And you will find a child, wrapped in bands of cloth and lying in a manger.” A child, born into a world of powers and rulers that built lots of walls. A child, born into a world of division and isolation. A child, born into a world full of fear, stress, and anxiety. On a night like this, God has come as Emmanuel to make God’s home with us. On an night like this, God has given us a savior who will tear down the walls and erase the divisions that have left us feeling so weary and alone. On a night like this, the walls come down so that we can see the One who is our peace, our joy, our hope, our love…..and such things are no longer a dream, but a reality. A reality that allows us not just to see Jesus, but to see Jesus in the faces of all those people we worked so hard to separate ourselves from. On this night, we need no longer live alone in fear – of ourselves, of each other. “Glory to God in the highest, and on earth peace among all God’s people.” Amen. We still have 4 more days left of the Advent season….4 days to wait until Christmas! Yet I don’t know about you, but it’s felt like Christmas the past 4 weeks (excluding the 70 degree temps! ): Christmas decorations have been up since right after Thanksgiving, and Christmas music has been playing on the radio even longer than that. You’ve all probably been to a couple holiday parties for work or with friends, bought most of your gifts, and even taking time to give a bit more to others – maybe serve, put money in the red Salvation Army buckets at the grocery store, or donated to a local charity. In some ways – and I don’t blame anyone – we as a world simply can’t wait to celebrate the holidays and celebrate Christmas: themes of hope, joy, peace, and love; the tiny baby Jesus, laying peacefully in a manger, so well represented by the Nativity sets that adorn our homes. In the midst of all this, I wonder if Advent and its theme of waiting is just simply too odd, too out of place. The message of waiting is unexpected, just like our text today. We hear a familiar story of an unexpected pregnancy to two unsuspecting parents, and the excitement and buzz created when that child is born into the world. Only, we’re not talking about Mary and Joseph today and the child we’re talking about isn’t Jesus, it’s John. As in John the Baptist. You may have heard of him……living in the wilderness, wearing animal skins for clothing, hair all disheveled, eating locusts and wild honey. John, who calls people to repent from their sin, performing baptisms….and John, who calls the rulers of the day and overly righteous things like “broods of vipers” and all sorts of brutally honest things. I think John’s birth and the prophesy that Zechariah gives about him causes us to slow down….it causes us to wait…to reflect. Perhaps in our excitement and rush to celebrate Christmas, how we see Jesus in all fullness coincides with when we pull out our decorations and do our celebrations; our understandings of the fullness of who Jesus is are synonymous with our sentimentality, happiness, and optimism over the holidays. Then a few days after December 25th, we put everything away, we go back to work, and we then inadvertently put Jesus away too, never really seeing him fully at work in our lives, or understanding such a notion is true. But reading about John in our worship this morning reminds us that Jesus shows up in the mundane and routine; in the chaos and darkness of our lives. Jesus is born into a world ruled by empire and full of violence – sounds familiar today, perhaps – that’s where we look for him. Maybe that’s unexpected, but perhaps with the way things are these days, that’s good news. And maybe that makes Advent not so odd to celebrate this morning, because it’s good to slow down 4 days before our Christmas Eve worship to wait…and reflect. For this morning, I think it’s ok we think a bit about ourselves, about us as St. Andrew [Holy Communion] Lutheran Church. I wonder, what unexpected role, task, or experience have you had in the church that helped you see God more fully, or helped others see God at work in their lives? The question seem confusing? Maybe an example would be helpful….my grandpa’s house was about 100 yards from the church where I grew up. As the temperatures began to fall, my grandpa would walk up to church every Saturday evening and turn up the heat and open the vents so that the sanctuary would be warm for worship on Sunday morning. After worship, my grandpa turned the heat down, and closed the vents. It saved on the electric bill for our tiny little church, who operated on a pretty small budget. My grandpa had been doing that for about 20 years without much notice. Yet there was one time, when my grandparents were on vacation, and the heat didn’t get turned up. Sunday morning, we all walked into a cold sanctuary for worship – pages were hard to turn because we had gloves on, and the organ sounded like a dying cat because the electronics wouldn’t warm up. In such a seemingly ordinary and mundane task, we all discovered unexpectedly how important it was – a warm sanctuary allowed us to come together in comfort to worship God in Word and Sacrament, and to understand how God as at work in our lives so that we too could see God at work in the chaos, routine, and sometimes, darkness that existed in our lives during the week. And so for the next 3 or 4 minutes I’d like you to take the time to think again: what unexpected role, task, or experience have you had in the church that helped you see God more fully, or helped others see God at work in their lives? Before I leave you to your time to reflect, I want to thank you for indulging me this Advent season in reflecting on a couple questions about the history and memories here at St. Andrew [Holy Communion]. I thank you for sharing with me, and teaching me…but more than that, I hope it has helped you this Advent season slow down and to see the Jesus we’ll come to celebrate on Christmas Eve in four days at work in your lives right now. I hope it has been for you as much a spiritual reflection as much as a history lesson…..Amen. In my hometown of Staples, Minnesota, population roughly 3,000, the Spot Cafe has been a mainstay. Located on the main street of town, it was a favorite of retired folk and business people, for breakfast, lunch, dinner, or a cup of coffee. And because Highway 10 took you through downtown, travelers would also stop, needing a bit to eat. The Spot Cafe caught your attention because of the large neon lighted sign that read “Spot Cafe” and had a flashing “spot” of circles that would flash from biggest to smallest. In our text from Ezra today, God’s people are allowed to return home to Jerusalem after 70 years of Babylonian exile. King Cyrus of Persia not only allows them to return home, but also give the people a special project: rebuilding the temple. And so it begins…..get the capital campaign started, get the temple built, and all will be right again. The text tells us the people rejoiced. Yet there were some – elders, priests, and anyone who had been around for awhile – began to weep. They cried amid the celebration, remembering how the old temple stood, and was destroyed. Old traditions that meant so much were lost. I guess my question is: why lament? The temple was getting to be newer, bigger, and grander. They were celebrating the laying of the foundation for the new temple, right upon the old one. Now, wouldn’t that make everyone, especially the old folk and priests, happy? I mean, people were worshiping God again and they were to embark on a massive church expansion project on the old foundation. Why lament amid so much rejoicing? Like the elders and priests of the time, I wonder too if we don’t have a bit of lament when it comes to tradition, the long-held kind. Even as things get nicer, newer, more capable and more convenient, we lament perhaps, the loss of those long-held traditions that seemed to hold a whole lot for us. However, we know things change over time….so what then do we do? I suppose we could dig a hole. Growing up in my home church Balsamlund Lutheran, I dug a lot of holes. The men’s club was always doing projects around the grounds…including digging holes for new posts, to check water lines, to install drainage piping, and sometimes, I believed, simply because the old men wanted something to do. As I got into my teenage years and the men a bit grayer, I suddenly found myself digging a lot of those holes while old men took rests, leaning on their shovels and in my mind, making me do all the work! But as I look back, I remember them telling me where to dig: they remembered where the water lines were, where to avoid digging because of power lines, they’d give advice on how to dig more efficiently, and they would of course, take their turn digging as well. To be honest, I loved digging those holes….I loved how my muscles felt afterwards, tired from the labor, but also satisfied that I had done something worthwhile. Yet even more than that, my satisfaction came from doing something together. It came from not only working alongside these old men, but also learning stories, learning more about them, and they more about me. I grew up with those old men, and I’d like to think we grew together……through the act of digging holes. God’s people came together in a similar way…..the first act as they returned home from exile before anything else was to worship – to rebuild the altar of the Lord and the temple so the people could worship God. Of course, the elders, and priests, and heads of household who remembered how things were destroyed by the Babylonians prior to being exiled, they lamented that tragic period of the past and what was lost. Yet that lament was overtaken by shouts of joy as the people – both young and old – began to worship the God again. On this third Sunday of Advent, our question for today is: what in the past has brought both young and old a sense of joy at St. Andrew/Holy Communion? It could be worship, or maybe you dug some holes together here…..but the joy in those experiences comes from the One who is our Joy – Jesus Christ. Christ unites both young and old. Jesus carries both our excitement and lament at the same time and for that, we can be joyful – the fulfillment that comes from the relationship we share with God in God’s only Son Jesus. The fulfillment of our hope; our expectation; our waiting. Our Advent. Amen. What if you’re someone who isn’t wired this way? My response? “I’m not wired this way.” My life right now is proof of that. I have three great callings in my life: pastor, Navy chaplain, and wrestling coach. (I don’t forget also that I’m a husband to my wife Kelly as well, so make that four!) I love each of these callings for what they bring to my life, how they compliment each other, and for how I see God at work in and through not just myself, but those I interact with. I hate that I feel pressure to conform to our current understandings of vocation and work, that I have to choose between them and prioritize them into a fixed structure that then becomes my career. That just doesn’t work for me. As I’ve stated, vocation is more about who I am versus what I do. Such a notion of “vocation as one true calling” doesn’t seem true to who I am. Moreover, as someone who truly loves being a pastor and believes that at the heart of ministry is relationship, it’s hard to reduce all of that to the realm of religious convention – the provider, performer, and manager of programs and services that happen in the building called “church” only. A bit of a rant: I get tired of colleagues and churchgoers who, when I tell them about my other roles as coach and chaplain and that I’m part-time in my call, make passive-aggressive comments that imply that I’m either not committed to being a pastor or that I’m not a “real pastor.” I can read between the lines of comments: how overly busy I am, that I’m not in my office, or that I seem to care more about the non-members than the members. The sentiment is I’m not 100% dedicated to being a pastor simply because I’m not physically around 100% of the time. As I sit here and read what I just typed, I am sympathetic to an extent. I can understand that it seems like I’m not 100% committed to the people I’m called to be pastor to. They’re the ones who pay my salary and so isn’t there an expectation for the goods and services they’re paying for? Shouldn’t they get their money’s worth out of my time? I think we’ve done a poor job as pastors and leaders in ministry by equating physical presence with relational presence. The truth is, your rear can be physically planted in the office 40 hours a week, but you can be totally checked out relationally. Fact is, I am committed to my congregations relationally. Yet relationship implies that there is a mutuality to the arrangement: congregation members have a commitment and responsibility to their relationship with their pastor and to the life and ministry of the church. For me, the vocation of the church is inherently relational. It’s just as much if not more about our commitment to living out who we are as what we do in the name of Christ. In the end, if we truly understand vocation as identity, then we shouldn’t have to choose. For pastors and leaders like myself, we shouldn’t have to choose. So what are bi-vocational pastors all about? What do they have to offer congregations that the conventional full-time pastor or ministry leader may not provide? I offer two “big ideas” about what bi-vocational leaders provide in ministry: Discipleship through modeling and “being church” as “co-conspirators” of mission and ministry. Discipleship through modeling. We are “multi-vocational beings” in that we have many roles, or stations (as Luther stated), in which our Spirit-given gifts, skills, and abilities are put to use. I am a Christ-follower whether I’m behind the pulpit and altar on a Sunday, ministering to the sailors in my command, or on the mat at 3pm for practice. My faith informs what I do, and those I am with inform my faith through the sharing of experiences and life. Most pastors and ministry leaders feel it is their responsibility to help people in their walk with Christ – discipleship. We not only want to make disciples, but be better disciples ourselves. Traditionally, we’ve done that through bible studies, excellent sermons, ministry events and programs, and providing learning resources, to name a few. But what if we modeled discipleship for people? One of the great lessons I learned both growing up on the farm and in the Navy was “lead by example.” Bi-vocational pastors and leaders are at the very heart of their ministry modeling discipleship; they are modeling how to integrate faithful living into the everyday commitments and passions of life. I juggle schedules just like everyone else does. I am more than just a guy who stands in front of people on Sundays or visits them when they are sick or have a problem. Such modeling, I believe, communicates to people that their faith is made up of more than just what they do in the name of X Lutheran Church or Y Methodist Church, or within its walls. Faith is something that encompasses their whole lives, the whole of who they are. That is vocation. Being church as “co-conspirators” of mission & ministry. So the logical question out of what I just wrote about discipleship is “who’s making sure that church happens then?” A fair question….particularly if the pastor’s not around the building as much. Confession: I just don’t like the expectation that I am somehow solely responsible for the successes or failures of a congregation. Yes, the secular definitions say that ultimately, accountability and responsibility of an organization resides with the leader. This line of thinking also leads to the justification that leaders then have ultimate authority within the organization. Both sentiments fall short within the understandings of church as community. Being church must fall under a more relational, shared model. Congregations that call bi-vocational leaders are committed to this way of being church. Bi-vocational pastors and leaders are called to be “co-conspirators” of a congregation’s mission and ministry. They are called as resources, advisors, and coaches who accompany congregations in carrying out God’s mission in being church. Leadership within a congregation becomes shared, and thus, decisions more communal. Yet I think there is an even greater benefit to bi-vocational leaders: it fosters the idea that all within the community are missionaries. Vocation, then is about being a missionary – one who shares Christ’s love in relationship with the world. Being church is about being a community of missionaries who share this primary vocation of being Christ-followers in the world. Being church is about being a community of missionaries who gather, weary from their labors to give praise, learn, and care for one another. The responsibilities of the community within and outside the walls of the church are mutually borne together. I am a missionary as a pastor who encounters newcomers who walk through the doors of the church, who talks with those familiar folks facing new experiences of faith in their lives. I am a missionary who serves young adults 18-22 serving in our Navy and Marine Corps all over the world. I am a missionary who bears the ups and downs of wins and losses, cutting weight, and who wrestle not only with opponents, but with themselves in a particular context – on a wrestling mat. My vocation calls me to ministry within and outside the boundaries I call “church.” And I suspect, that the same is true for people in congregations across the United States. I am not wired this way; for one set line of work, at least. I have too many interests and frankly, don’t see any benefit in giving any of them up in favor of the other. I don’t expect every congregation, colleague, or person to totally get it or even agree with it. But when I think of everything the church is facing these days, my belief that this Christ who died and raised for us still matters, and my vocation proclaims Christ crucified and risen, even though it’s strange….I guess I’m totally fine with that. Even more, I think God is too. Israel now lives in exile, relocated from their home in Jerusalem to Babylon. One way to think about this passage is that the prophet is talking about the people’s faithfulness: it’s fleeting, like grass. But for us today, I don’t think that’s the focus. I think, rather, it’s the revelation that despite what we think to the contrary, our efforts and we ourselves simply don’t endure the test of time. The world changes: newer, faster, different things matter. We change: interests, plans, some get married, some have children, and of course, we all get older. To be human is to not last. Very few of us do things that leave a mark on history that echoes through eternity – for example, tomorrow is Pearl Harbor Day – and even if we do, they all eventually wither and fade away for good – and like them, we die. I wonder sometimes, if our ultimate worry isn’t so much we’re bad people – sinful, faithless. Rather, it’s that we’ll be forgotten, insignificant, irrelevant – or that we already are. In the end, all our work and efforts just fade and wither away into history with barely a whisper. I think that is what grips congregations across America these days….it’s the fear that if we don’t survive, all of our efforts, the little church that we’ve put all our blood, sweat, and tears into will just fade and wither into insignificance, and die. And I think that’s a perfectly legitimate feeling to have. Who will remember all the ministry at this church – a place where people were not just served physically, but were spiritually fed? Who will remember all the laughter and tears as people shared the most intimate parts of their lives with each other – a family. A home, a place of comfort. What, then, endures the test of time? Before I became a pastor, I volunteered a lot of my time doing youth ministry in congregations as the Navy took me from place to place. Sharing that time with youth was always meaningful, and I’m thankful for all the pastors and parents who trusted me enough to take part and in some cases lead their congregation’s youth ministry – taking kids on mission trips, planning retreats and weekly youth meetings…..I was responsible for the faith formation of middle school and high school kids. Yet, because the Navy moved me around so much, my time in those churches was short-lived, and I had to leave the church, and the youth and their families behind. I remember the goodbyes – so hard. And I remember thinking, “Who’s going to carry this on? Who’s going to keep up the momentum? Who is going to minister to these kids like I can? My worry was all the hard work that I had done…..it would wither and fade, never to be remembered. Looking back, that was just so short-sighted of me. It wasn’t my efforts or even my presence that would stand the test of time. It was that through my efforts, God’s Word was being experienced by youth and their families in that particular place and time. And even though it’s been years since I’ve been in those congregations, I carry with me the hope and assurance that God is still speaking to youth and families in those churches, through different people and in new ways. The good news is, what endures is God working through it all – through ministry that fed youth and families spiritually and ministry that brought comfort in such a crucial time in their lives. What endures the test of time? Advent is a season in which we recall the good news of Christ’s coming so long ago, and that message is an enduring message of hope and peace that speaks to us even today. And in Christ, this Word of our God will continue to speak – and act – in and through the church in a way that brings comfort to those in need, and feeds God’s lambs…..even long after we’re gone. And so with that, I leave you the next 5 minutes…..Amen.